Ingrown hairs are a relatively common problem that both men and women suffer with. It is often associated with shaving, but there are other causes. And while it may be uncomfortable and look unpleasant, it isn’t a sign of a more serious condition. There are various ways to deal with ingrown hairs and to reduce the chance of them reoccurring. In our guide to ingrown hairs, we will look at the most popular causes and treatments of this awkward condition. An ingrown hair is a hair that has started to grow from its follicle as normal but for one reason or another, has turned back on itself and grown into the skin rather than through it. The result is a small, raised bump or lump on the skin that often becomes red and inflamed. This redness is usually a sign that there is an infection within the follicle caused by the ingrown hair and can often be itchy. Ingrown hairs can look unsightly and are most common in areas where the hair is thicker such as on the face for men and under the arms, on the legs or around the bikini line for women. These thicker hairs coincide with the areas that we are most likely to shave and this shaving process is one of the top reasons that ingrown hairs occur. Curly haired people are also more likely to get ingrown hairs because their hair is thicker and naturally has a curl that can lead to ingrown hairs. This also means that people of African-American and Latino background may be more prone to ingrown hairs – but anyone can get them, even with the finest, thinnest hair. Ingrown hairs are correctly known as pseudo-folliculitis – meaning it isn’t the true version of folliculitis. It can also be mistaken for other conditions that can have a more serious effect on the skin. Folliculitis is an inflammation of infection of the hair follicles and is more serious than an ingrown hair as it can affect anywhere on the body. Both conditions can lead to small bumps, redness and even an infection that means there is pus filling the lumps. There are different types of folliculitis including those affecting the beard area of men and those that come after the long-term use of antibiotics. Other conditions that can look similar to ingrown hairs include eczema, heat rashes, keratosis pillars (also known as chicken skin) and impetigo. If you are unsure whether you have ingrown hairs or one of these conditions, you should always talk to a doctor or nurse before treating the condition. We all know prevention is better than cure so what can be done to prevent the ingrown hairs from occurring in the first place? The answer depends on the cause of the problem, but there are several strategies to put into place that will greatly reduce the chance of ingrown hairs occurring. As shaving is the most common cause of ingrown hairs, look at how you shave. Most of us don’t think too much about how we shave, but there is a good way to do it – shave in the direction of the hair’s growth. When we shave against this, the end of the hair becomes sharpened and is more likely to become ingrown. By shaving in the direction of the hair growth, the chance of this is reduced. Also, shave after a bath or shower when skin is warm – this opens up the pores and makes it easier to shave as well as giving a better result. The fewer times the razor passes over your skin, the better. Make sure the razor is as sharp as possible as this makes it easier to cut through the hairs and leave a smooth, soft end. Another top cause of ingrown hairs is when dead skin clogs the pores and stops the hair growing out in its natural way. One of the best ways to deal with this is to use an exfoliating product before shaving. This removes the top, dead layer of skin and makes it easier to cut the hairs with the razor. Many of us use exfoliating products on our upper bodies, so simply include areas that we shave into the program. There are also special products available that are designed to help prevent the hairs ingrowing in the first place. 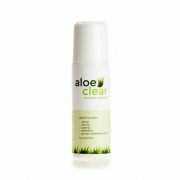 Many, such as Aloeclear, make use of natural ingredients such as aloe vera and peppermint. They are applied in advance of shaving or another hair removal as well as afterwards and can have a dramatic effect on the number of hairs that become ingrown. Sometimes, despite all our best efforts, hairs have a mind of their own, and you end up with ingrown hairs. There are various ways to deal with ingrown hairs when they do occur. Before dealing with an ingrown hair, it is important to deal with any possible infection to the hair follicle. Even if there is no pus, it is worth using an anti-inflammatory or antibacterial cream for a few days. A chemist can advise what would be best. This kills the infection and makes it easier to treat the cause. Once the infection has eased, you are ready to deal with the hair. Use a warm compress to open up the pores of the skin – this is simply a warmed facecloth or towel pressed onto the area of the ingrown hair. Do this for around 5-10 minutes. Take a pair of flat headed tweezers and gently ease out the end of the hair then pull the rest free. Be careful not to dig into the skin as this can cause further infection and even leave scars on your skin. Ingrown hairs look unpleasant and can be quite painful, so most people try to use steps to avoid them. If you do find yourself prone to them, using preventative products or even considering waxing rather than shaving may be a good option.